Time for film study. 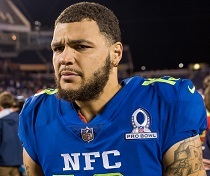 A three-time Pro Bowl defensive back and a retired stud receiver have broken down all things Mike Evans. The video below is from CSN Washington, featuring Deangelo Hall and Santana Moss. Hall calls Evans “a poor man’s version of Julio” Jones, stressing he’s not trying to throw shade at Evans. Moss, one of Joe’s favorite receivers in NFL history, claims Evans is “the bully of receivers.” Lot of good Xs and Os here, including how covering Evans changes in the red zone. Perhaps Hall can come and coach Bucs cornerbacks next season? So Julio Jones is a rich man’s Mike Evans. Or should I say Mike Evans is supposed to be what Mike Clayton should of been. Man our fans are dumb. These threads remind me all the time lol. I don’t care what anyone says, Mike is a top 5-8 receiver. I’ve never seen Julio as disinterested and disengaged as Mike was last week. Strangely, he’s good for one/two real stinkers a year- usually against aggressive, press CBs. Don’t get me wrong, Mike’s the least of our problems- and may go down as the best post SB era Buccaneer, but sometimes, the body language is just not good. Sometimes he seems to get caught up in his own head. Mike Evans had more 1st down receptions than any wr in the league last year. You guys are ridiculously stupid. Posts like this make it really hard not to go on the attack, lol. Ya so hard I had to say something. Bonzai I gotta give u respect. 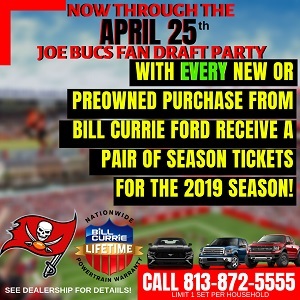 You’re in the minority of intelligent bucs fans. Mike Evans is the best player on this team and has been since he arrived. He isn’t a poor man’s Julio, he is Megatron 2.0, without a good QB. So much is broken on this team. The receiving Corps is probably the only part of the team that is actually good. ME 13 is a baller. Some people are really ignorant. I saw a statistic if we had buffalos defense which is ranked 26th, then we would be 5-3. Maybe better. We’re getting there. Offense is legit and will be for a while. Just need to clean up right side of ol and upgrade on RB. Even if we have to move on from Jameis which I don’t think happens, a new QB will have tons of pieces to step right in. Now we can focus primarily on the defense and get a solid DC without archaic ideals. But the absolutely worst thing about us is our fans. Went to the Carolina game Sunday and saw maybe 100 of us. Most of which were ruder than Panthers fans and much dumber sad to say. Mike evans drops the ball way to much…. It’s a pattern. Can you really rely on that to catch a game winning td? If you don’t think Evans is a top receiver in this league, especially when the Bucs have had nothing at receiver for the last 15 years except for Vincent Jackson, then you are high on some good stuff. Evans is a stud who deserves a better QB. Thomas, Diggs, Edelman, and Fitzgerald (currently) are not better than Evans. And AJ Green can’t stay healthy otherwise he would be but he isn’t. Evans is top tier and idk why Bucs fans can’t see that. Evans is quite possibly the best receiver in Bucs history. Oh wow another surprise dumb comment! Rest are debatable but man you guys are dumb as ****! Mike Evans= Best Buc Receiver in Franchise history. Jameis Winston = Best QB in franchise history. DeSean Jackson= WORST free agent signing in buc history. Donovan Smith= Laziest Left Tackle in NFL history. LVD= Quickest WASHED up LB in buc history. KWON= Quickest to talk SH!T but he aint SH!T in buc history. Justin Evans= Best secondary potential on the team. Cameron Brate= Worth every penny. OJ Howard= WILL be WORTH every penny. Ryan Fitzpatrick= Greatest con man in Buc History. Dirk Koetter= DUMBEST coaching hire in buc history. Buckner = Love the attitude but wheres the coaching? JOES= Your articles reflect how feel towards the outside world. IRA= You represent the knowledge and SAGE we need to follow this team. Mr. Brooks= You represent how we communicate to fellow buc fans in person. I’ll actually give u thielen if he continues this but he’s got a lot to prove. To be fair, just about every other receiver could be considered a poor man’s Julio… Just depends on how poor you are. Don’t see the Evans to Jones comparison. I see Evans as a poor man’s Calvin Johnson, Evans and Jones have two completely different games. Evans is about high pointing the ball, out physically DBs for the ball and being fast enough to keep them honest. Jones is about speed and power and running after the catch. Our poor man’s Julio is Chris Godwin, Evans is a poor man’s Calvin Johnson, DeSean Jackson is a poor man’s DeSean Jackson… because he isn’t quite what he used to be but he hasn’t fallen that far. Way overrated and way too many drops. Wouldn’t mind seeing him traded. Pelbuc= Typical complaining buc fan who much rather indulges in the toxic atmosphere of loafing players in hopes the organization blows everything up every other year because of the drama that follows. All in the meanwhile, completely and utterly ignoring the fact that the one player who gives 100% they are labeling “overrated” and is willing to trade them. In other words Pelbuc= moron. Lmao… I can’t believe there are haters of Mike Evans. One of the best receivers in the damn game… just happens to be playing on the worst team. SMH. Mike Evans is Vincent Jackson Jr.
ME is a really good receiver tittering on elite, but he does slack off and I’ve hardly ever seen him layout for catches. WR’s like Julio will try just about anything to catch a ball. ME will jump for balls but he does not like to layout for them. 3. Mental sharpness (many here ie: lackadaisical, fights, drops, penalties etc. Excellent video, well done by the Redskins staff there. Also I don’t really think saying a poor man’s Julio is an insult, not the way he means it. I think Julio is literally the best WR in football (yes, better than Brown) and he’s saying he’s the same type of guy just without the speed. Mike has a rap for not being all that fast, which I don’t really agree with, he’s faster than people give him credit for and shows that when he gets the ball in the open. Then again most of the time, like the Carolina game, he’s being double teamed and usually being tackled on the play. Remember that Mike Evans was brought to be taught by VJ, and I really think that’s a perfect comparison. VJ had a bit more speed when he was younger, but he lost it as time went along and changed the style of his play to be a lot more physical, and that is what Evans was taught. Anyways, again, good video, really interesting, was good to have 3 mins about the Bucs without doom and gloom.